The Rancho Cielo Youth Corps builds furniture, bird houses and frames. We always accept lovely wood with character that can be used for that purpose. We are in need of a storage container, preferably 20 ft long. We can pick it up. 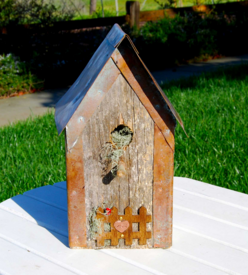 The birdhouses have copper sheeting on them, making them very special. However, that sheeting is expensive. If you have copper scraps or sheets that could be used for that purpose, that would serve as a wonderful donation. (see photo of birdhouse). The Drummond Culinary Academy is being outfitted with top of the line culinary equipment (pots, pans, etc.). If you have such items, please consider giving us a call. The Judge loves classic cars. They must be in great condition (we do not yet have an auto shop, although that is planned), suitable for sale. Thanks! We need vehicles that are in good working order so that we can run our programs more effectively. Passenger vans, pick up trucks, decent cars that graduates can purchase so that they can get to their new jobs, all are needed. Rancho Cielo is in need of the following items for its Culinary-Leadership Garden. We gratefully accept either the items themselves in new or gently used condition, or donations for the approximate cost. We are in need of Washers & Dryers for our Transitional Housing Village. We have electric hookups and would be very appreciative of Washers/Dryers that are in good condition. We have no money to repair ones that may be in need of a little TLC so perfect working condition is best. Thank you!